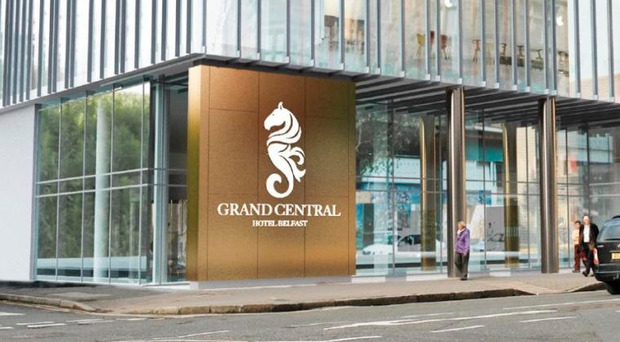 Last month saw the opening of the latest landmark hotel in Belfast, a significant milestone for our hospitality and tourism sectors. But the fact that the cost of a pint in its penthouse bar has attracted as much attention as its rooms and restaurants, perhaps gives us some insight into the current performance of the Northern Ireland economy. The Grand Central's Observatory bar's £8 for a pint makes it the most expensive in Ireland; more than the €8 per pint that punters are paying in some Dublin pubs. So, is this beer-price inflation a sign of a booming economy? We have £8 per pint, but do we have a £8-pint economy? In short, no. On the one-hand, the Grand Central and its expensive beer highlight the success of our booming tourism industry, with new records being unveiled on almost a monthly basis, as visitors flock from Europe, America and elsewhere. The fact that the hotel has such confidence that tourists will come to stay in Belfast and pay such premium rates for a pint, highlights how far we have come. Yes, there are some restaurants closing at present due to competition and a squeezed domestic market, but, the huge benefit the hospitality sector is seeing from tourism is undoubted. Just a couple of years ago, the Grand Central was an iconic eyesore, as an aging Seventies office block. But the new owners really have made a silk purse out of a sow's ear, creating a truly iconic hotel in the centre of Belfast. It is effectively a beacon for our burgeoning tourism industry which is bringing investment, jobs and international spend to the city and Northern Ireland as a whole. However, there will be those who have heard £8 per pint and think the country has gone mad - bearing in mind that £8 is more than the National Living Wage of £7.83 per hour and almost double the rate for 16-17-year-olds, which is £4.20 per hour. If you are on a pub-crawl, you definitely wouldn't want to draw the short straw of having to buy a round in the Observatory; though in reality that's probably not the crowd they want. We may have significantly climbed the rankings in terms of tourism competitiveness globally. For instance, 'Belfast and the Causeway Coast' was ranked 'the number one region' to visit in the world for 2018 and Titanic Belfast was voted the 2016 top international attraction to visit. However, can the same be said for the competitiveness of other areas of the economy? The answer is that in many respects tourism is a bit of an outlier, alongside other star performers such as the IT sector and individual world-leading companies. Tourism now has the strength in-depth (in terms of product, infrastructure and international reputation) that other sectors, and the economy as a whole, don't have. When in the Grand Central's Observatory bar, you can survey the skyline of Belfast and get a perspective on what's going on in the city, with the growing number of hotels and the number of cranes in the skyline, providing instructive insight. In similar fashion, if we survey the economy from the economist's observatory, we can see that yes there are highlights such as tourism, but we can also see that there are clouds. With tourism, like other parts of the economy such as agri-food, the challenge isn't the demand side, it's on the supply side. There is plenty of demand for their products but there is a big question-mark around the supply of labour. A recent report by the London School of Economics (LSE) states over one-third of UK businesses in the food and drink industry would be unviable if/when they lose access to non-UK EU national workers. We also see clouds in relation to infrastructure. Whilst tourism has made big strides with its infrastructure as many hotels and attractions have been developed and are pulling in visitors, the same can't be said for our wider infrastructure. Last week brought this into sharp focus with the legal challenge to the York Street Interchange procurement process, which will delay this essential piece of infrastructure further. And the outlook isn't positive. York Street is one project that we did have ministerial approval for, but we are now in a decision-making stasis, which means that for the foreseeable future, other major infrastructure schemes won't even get approval in the first place. It's hard to imagine how we could be any less competitive internationally when it comes to planning, government procurement and ultimately the delivery of economic infrastructure. This is an area, perhaps more than any other, where we need to learn from our tourism sector's success and apply global best-practice as it has done. In conclusion, we need to avoid seeing the £8 per pint as signalling a booming economy; it doesn't. But it also arguably doesn't point to froth in the economy, unlike in 2006 when Belfast unveiled the world's most expensive cocktail. It simply tells us that in niche areas Belfast and Northern Ireland are doing very well. The challenge is to broaden that out into other areas and for many more sectors to create their own USPs, their own international-class infrastructure and their own world-leading products. By Staff Reporter Northern Ireland property investment company Lotus has announced the letting of offices to the Scottish courts services. By Margaret Canning Belfast's Donegall Place, formerly the city centre's prime shopping area, needs more investment to thrive following the effects of the Primark fire, it has been claimed. By Margaret Canning Northern Ireland's commercial property sector is performing well despite Brexit uncertainty and demand for retail sites remaining in the doldrums, according to a survey today. By Margaret Canning The leaders of six Northern Ireland firms have been shortlisted for the Ireland-wide EY Entrepreneur of the Year Award.